In a world first study, researchers have found a coral-eating fish that disguises its smell to hide from predators. “For many animals, vision is less important than their sense of smell,” says study lead author Dr Rohan Brooker from the ARC Centre of Excellence for Coral Reef Studies (Coral CoE) at James Cook University. “Because predators often rely on odours to find their prey, even visually camouflaged animals may stick out like a sore thumb if they smell strongly of ‘food’,” Dr Brooker says. 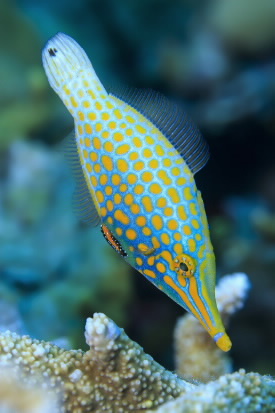 The research, published in the journal Proceedings of the Royal Society B, found that the harlequin filefish changed its smell to match the coral it ate. “By feeding on corals, the harlequin filefish ends up smelling enough like its food that predators have a hard time distinguishing it from the surrounding coral habitat,” Dr Brooker says. Study co-author, Professor Philip Munday from the Coral CoE says the ability to chemically camouflage itself is a great advantage for the fish. Professor Doug Chivers from the University of Saskatchewan, who is also a co-author, agrees. “A finely-tuned combination of visual and chemical camouflage may be an effective anti-predator strategy that helps the fish to avoid being eaten,” Professor Chivers says. Not only does the filefish confuse its predators, it matches the odour of the coral so closely that small crabs, which live on coral branches, couldn’t distinguish it from coral. Professor Munday says it’s a remarkable example of how closely animals can adapt to their habitats. “However, the filefishes’ cover is blown if it shelters in a different species of coral to the one it has been eating. Then the predators can distinguish its presence and track it down,” Professor Munday says. The ability to chemically ‘blend in’ occurs in some plant-eating invertebrates, but this is the first time this type of camouflage has been found in higher order animals, such as fish. “This is very exciting because it opens the possibility of a wide range of different animals also using similar mechanisms, right under our noses,” Dr Brooker says. You are what you eat: diet-induced chemical crypsis in a coral-feeding fish by Rohan Brooker, Philip Munday, Doug Chivers and Geoffrey Jones is published in the journal Proceedings of the Royal Society B.